Returning back to BellaNaija as a Guest Beauty Contributor, one of the challenges I faced was What to write. As shocking as that may seem, the question plagued me for a while before I sent a mail to the Beauty Editor with the perfect return post. The idea? Go back to the very beginning. There are many aspects to getting your makeup routine ready – and one of those very important aspects is getting the right must-have brushes. Now I know your mind is probably wandering to the 24 brush set you see makeup artists strap to their waist. Do not be afraid.Your everyday routine might not need that many brushes. Usually you see a lady whip out her very pretty makeup purse, lay out her makeup for touch-ups and you secretly approve. But you are later in shock when you see her use the same brush for her powder, foundation and blush. You may or may not have the courage to walk up to her and ask her why knowing you might get the response of “what do I need the extra brushes for“. So today there will be no makeup techniques. 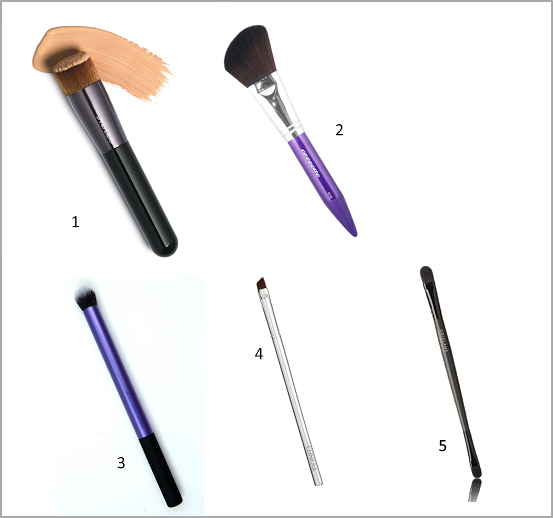 We are on a rewind to the basics of 5 must-have makeup brushes EVERYONE should have. We will leave out the tons of others which can be confusing and just stick with the basics. Not only will these 5 simplify your makeup process, they can handle at least 2 different tasks each and are guaranteed to get you looking finely polished by the time you are done. The only catch is that you have to use them well. 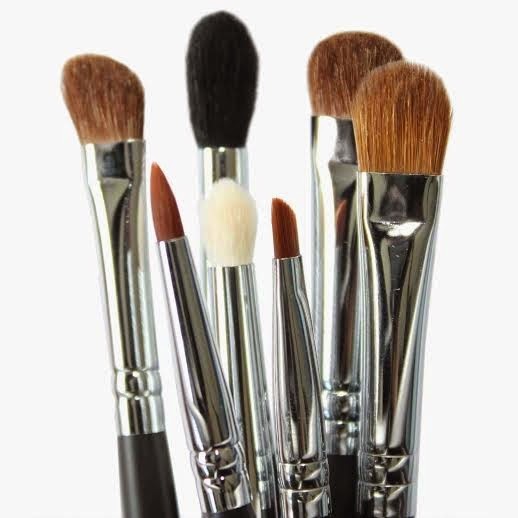 Foundation Brush: As the name implies, this is used to apply any type of foundation. A foundation brush like the Shiseido Perfect Foundation brush can be used for a moisturizer, primer, foundation and cream blush. Wondering about the shape which is unlike that of the traditional foundation brush? It not only applies the product but is also great for buffing the product into the skin so it is fully absorbed leaving you with a natural finish, hence the shape. Buffing is done by using the brush on the skin in a circular motion. Powder Brush: This is usually dome shaped, huge and very fluffy. However, artists have begun to use smaller brushes so brush manufacturers keeping this in mind have adjusted to this trend. That’s why there are angled, small powder brushes which double as blush, contour and bronzer brushes. An example of this is the Cozette S110 brush which will fit nicely in a makeup purse and is multi-purpose. While dusting powder on the face is a preferred method so the face isn’t too matte, we accept that there are different methods of powder application. Use the edge of the brush to contour and the high tip to apply blush. Finish up with bronzer on the perimeter of your face. The only snag is you have to make sure you remember to dust the brush on a tissue between applications (i don’t though). Eye Brush: The good Lord knows that this process is usually broken down into sometimes 5 different steps. However, in the spirit of making things a lot easier, we are presenting just one step to you with this dome shaped, dense eye brush. For once pretend you know nothing about a cut crease and apply a sweep of your favourite colour eye shadow to your eye lids blending it into your crease and out. A brush like the Real Techniques Deluxe Crease brush will also blend out concealer under your eyes and around your brows while working double time to ensure that your intense black smokey eye is blended out just right. Angled Liner Brush: We all want defined brows and we won’t begrudge you that. An angled brush and a matte brown powder are the best combo for perfect, natural looking brows. Switch it up by using that same brush and a gel/cream gel to create the perfect winged liner ever. Lip Brush: Yes, a lip brush. Wondering what it can do? A lip brush is what stands between you and that perfect Marilyn Munroe red lip. Got a rounded lip brush? Defined brows and a perfect pout using concealer for perfection is just a look in the mirror away. Get a dual ended lip/concealer brush like the one above from Oriflame and you are next to heaven. Those are my must-have 5, what are yours? Be sure to share them in the comments below.